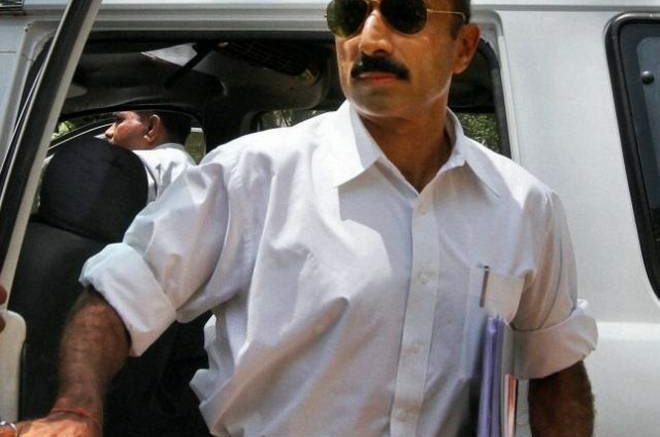 Former Gujarat police officer Sanjiv Bhatt’s wife Shweta Bhatt has alleged that state agencies are “colluding to harass” her and her husband after his bail hearing on October 23 was delayed in a 22-year-old narcotics case. Bhatt is now due to be produced in a Palanpur Court on October 30 for a routine check required every 14 days when an accused is remanded to judicial custody. Bhatt was arrested by the state CID in a narcotics planting case that has been pending since 1996, when he was the Banaskantha Superintendent of Police. I.B. Vyas, who was a police inspector with the local crime branch at the time and who led the investigation in 1996, was also arrested on the same day. The arrests come five months after the Gujarat high court directed the agency to conclude its probe within three months. “We were not even informed that the high court had passed such an order,” Shweta Bhatt said about the order, adding that her husband had been granted leave in the matter. In a Facebook post, Shweta Bhatt detailed the morning of the arrest. “On the 5th of September, the CID Crime branch entered our house at 8am‬, on the grounds of picking up my husband for recording his “statement”. It is worth mentioning that the CID Crime Branch officers entered our bedroom while I was sleeping there, in full knowledge, shamelessly invading my privacy, despite Sanjiv having already met with them and changing to leave with them,” she wrote. The corporation then sent them a bill, which The Wire has accessed, charging the couple Rs 2.25 lakh for “demolishing illegal construction”. “All this when I’m fighting to ensure my husband is released from custody. My only priority is to get him out. They should know, these harassment tactics will not work,” she said. Sanjiv Bhatt had filed an affidavit in the Supreme Court in 2011, stating that the then Gujarat chief minister Narendra Modi had stoked communal anger in the state in wake of the Godhra train carnage of 2002. Detailing a meeting held on February 27, 2002, Bhatt claimed that he was present when Modi told senior police officials to let “people to vent their frustration”. Bhatt was suspended from the Gujarat police shortly after he submitted his affidavit due to “absence from duty” and eventually sacked in August 2015. “This is part of the preparations for 2019 elections – Modi and Amit Shah want to make sure that all dissidents are silenced and old cases are wrapped up,” she told The Wire. The case against Bhatt dates back to April 30, 1996, when based on an anonymous tip to the control room, the police, led by Vyas, raided a hotel room in Palanpur. The caller had claimed that a man named Sumer Singh Rajpurohit, a resident of Pali in Rajasthan, was staying in room 305 with 5 kg of opium. On May 3, 1996, Rajpurohit, a lawyer, was arrested from his Pali residence. Five months later, on October 17, 1996, Rajpurohit sent a complaint by registered post to the chief judicial magistrate in Pali, alleging that the arrest was part of a conspiracy to force him to give up his claim to a shared a property. The conspiracy, he claimed, was masterminded by Bhatt, Vyas and other police officials at the behest of Justice R.R. Jain, who retired as Gujarat high court judge. A case was filed against Bhatt, Vyas and others based on this complaint at the Pali-Kotwali police station, which continues to this day. Bhatt and Vyas have been charged under various sections, including criminal conspiracy, giving false evidence and wrongful confinement of the Indian Penal Code and Sections 17 (punishment for contravention in relation to prepared opium); 58(1) and 58(2) (punishment for vexatious entry, search, seizure or arrest) of the Narcotic Drugs and Psychotropic Substances Act (1985). Some of the sections attract a maximum punishment of life imprisonment. In its latest remand application, the Gujarat CID (directed to investigate the case in April by the Gujarat HC) has claimed that they require Bhatt’s custody to question him about the false tip and his alleged role in the conspiracy. Previously, the state had defended Bhatt and Vyas’ investigation of Rajpurohit. In a petition filed before the Supreme Court in 2000, which granted reprieve to both officers, the Gujarat government argued that errors made in the course of an investigation could not be held against the officer if they were discharging their duty in good faith. Further, the petition states that the chief judicial magistrate in Pali had no legal standing to initiate proceedings against police officers in Gujarat. The state also wondered why Rajpurohit had not made these complaints when he was produced before magistrates and why it took him five months to file the written complaint. “From the 5 of September till the 12th of October, it’s been 37 days since Sanjiv was taken away from home, from his family, in a 22-year-old case. Yet today we are still struggling for bail. The next hearing is on the 16 of October, and we really hope that justice does prevail on that day”. wrote Shweta on Facebook. “It took this man close to six months to file a complaint. The Supreme Court had already granted my husband leave in the matter. How can the Gujarat HC ask for it to be reinvestigated?” Shweta Bhatt told The Wire. “They are investigating the same issue which has been probed and adjudicated. Even if they needed to interrogate him, such a lengthy remand is unnecessary,” she said. The next bail hearing is scheduled for November 12, which will be almost 70 days after his arrest. Be the first to comment on "Sanjiv Bhatt’s wife has alleged that state agencies are “colluding to harass” her family"